StaLok Paver Sand sets up strong and locks in between pavers. It allows water to drain and ‘heals’ itself. The sand repairs cracks and fills any voids that have developed. It is firm enough that you can power wash it when dry. 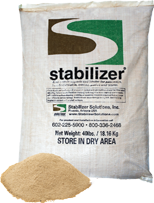 After water begins to collect during a storm, StaLok Paver Sand acts like a sponge. It soaks up water until it is saturated, then drains.